Henry Pether specialised in moonlit views of London. Here he depicts two of the city’s finest structures built in the eighteenth and nineteenth centuries. The exquisite neoclassical Somerset House was designed by Sir William Chambers in 1775 to house government offices and learned societies, including the Royal Academy: he was inspired by the grandeur of ancien régime Paris. Framing the building, with its magnificent south-facing terrace, is John Rennie’s bridge (1811-17), originally called the Strand Bridge, but renamed to honour Britain’s final victory over Napoleon on 18th June 1815. Waterloo Bridge was opened with huge pomp by the Prince Regent on 18th June 1817, an event memorably painted by John Constable. 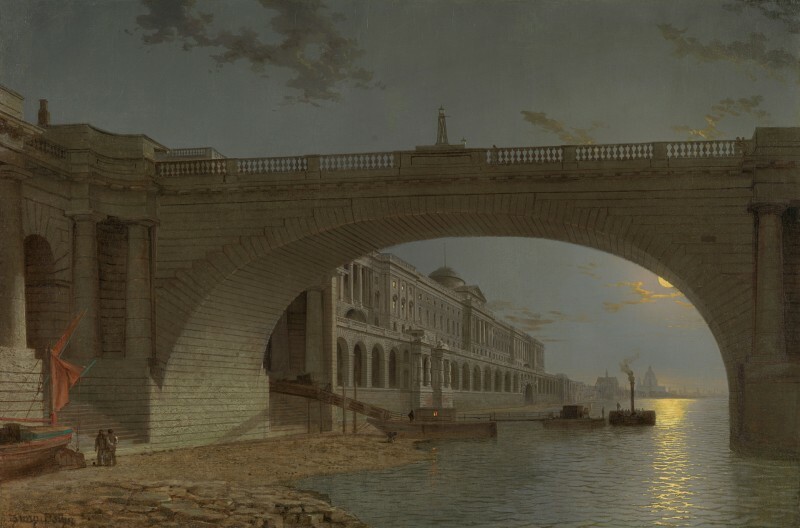 Pether depicts the Thames before it was embanked from 1868-74, as part of Sir Joseph Bazalgette’s great scheme to improve the flow of the Thames and London’s drainage and sewers. At the far left is a traditional Thames commercial sailing craft; on the right, with moonlight rippling past it, a steamboat with the silhouette of St Paul’s in the distance. Steamboats plied the Thames from 1815 onwards, including the Margate steam packet much used by JMW Turner. From 1848, when Waterloo station opened, the Westminster Company ran a ‘penny boat’ (named for the price of its fare) which took gentlemen from the City to the station. Henry Pether was born into a family of artists who specialised in moonlight scenes: he was the son of Abraham (1756-1812) and the brother of Sebastian (1790-1844). His father’s cousin, William Pether (1738-1821), was a well-known engraver. Pether exhibited at the Royal Academy from 1828 to 1862, as well as at the British Institution and the Society of British Artists. He painted views of London, the English countryside and Venice. The work of Henry Pether is represented in Tate Britain, London; the Government Art Collection, London and the Museum of London.